PT Wijaya Karya Beton Tbk - WIKA Beton is a directly-owned subsidiary company of state-owned contruction giant, PT Wijaya Karya (Persero) Tbk (WIKA Group) that is involved in preacast concrete industry. WIKA Beton operates primarily as a producer of high-quality concrete products, including piling, bridge beams, retaining walls, bearings street railroads, pipes, concrete products and concrete maritime buildings. At present, WIKA Group holds 60% shares in WIKA Beton. Other 40% remaining shares was owned by the general public. WIKA Beton was first established in 1977 as a division of WIKA Group. 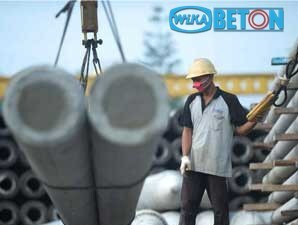 Later in 1997, WIKA Beton officially established as a separate legal entity. In 2014, the Company went public and its shares listed on the Stock Exchange (IDX) under ticker code WTON. Headquartered in Bekasi West Java, WIKA Beton runs its business through 8 concrete plants, 6 sales area offices and 2 sales representative offices spread across Indonesia. in term of financial position, PT Wijaya Karya Beton Tbk showed a strong performance in 2014 and recorded a growth of 23.96% in total operating revenue amounted to Rp3,277.19 billion as compared with Rp2,643.72 billion in 2013. Total net profit went up by 33.66% from Rp 241.20 billion in 2013 to Rp322.40 billion in 2014, according to WIKA Beton Annual Report 2014 as cited by JobsCDC.com. Male with the maximum age of 28 years old on 31 March 2016. Background in Diploma Degree (D3) in Civil Engineering. JobsCDC.com now available on android device. Download now on Google Play here. Please be aware of recruitment fraud. The entire stage of this selection process is free of charge. PT Wijaya Karya Beton Tbk - D3 Fresh Graduate Admin Staff WIKA Group March 2016 will never ask for fees or upfront payments for any purposes during the recruitment process such as transportation and accommodation.